SERGIO. Okay, no, actually NACHO. Prince Harry fell off his horse. That's the closest thing to a SportsCenter highlight from Sunday's third annual Veuve Clicquot Polo Classic on Governors Island — the reason why Harry was in town and available to toss out the first pitch at Citi Field. He'd been streaking down the sideline looking to score when his mount pulled up and Harry didn't, somersaulting him onto the pitch. Unhurt, he climbed back in the saddle, and the mishap was immediately forgotten by the swells quaffing Champagne on the sideline, along with the rest of the match. Despite ending in a 6–5 overtime thriller — with Nacho Figueras's Black Watch team avenging last year's loss to Harry's Black Rock — the sport in this sporting event was largely an afterthought. (Although true to form on Sunday, it was a triumph for Argentina and an embarrassment for England, in the other event.) The match was a friendly for charity, and with tables in the VIP tent going for as much as $50,000, New Yorkers like Mayor Bloomberg and Russell Simmons had finally found a ticket that made the seats behind home plate at Yankee Stadium feel cheap. (Proceeds went to Sentebale, the Prince's charity for AIDS orphans in Lesotho). The New York Times described the scene as "a satellite of the Hamptons," and no doubt many of the revelers were happy to think of it that way: A frivolous afternoon in the sun spent sweating out free bubbly as fast as they could drink it. Maybe the only one who wanted more was Nacho, who is open about his desire to popularize polo. He's already his sport's Derek Jeter — the charismatic captain nowhere close to being its best player — with a modeling contract, team sponsorship, and clothing line from Ralph Lauren. Nacho likes to compare polo to Formula One, an esoteric, stratospherically expensive sport with mass appeal in Europe. Perhaps a better comparison are the U.S. Opens of golf and tennis, which draw frenzied, moneyed crowds to Flushing (and occasionally to Winged Foot and Bethpage Black) to rub elbows with corporate sponsors. Befitting polo's image, Sunday's included Ferrari, Piaget, and BlackRock, the largest wealth management firm in the world. If there were ever a moment when New Yorkers might embrace polo, it would be the day after the U.S. had been eliminated from the World Cup, when soccer was still fresh in our minds. 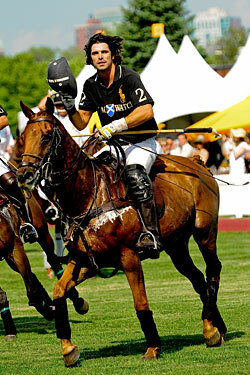 Polo might best be described as soccer on horseback, with a striker (the No. 1 position), a wing (No. 2), a sweeper (No. 3), and a defensive back (No. 4), although there's no keeper guarding the posts. A team's best player is typically stationed as the No. 3 (on one side, Nacho), clearing the ball on defense and passing upfield to the striker, on the opposite side, Prince Harry. Harry's Black Rock team led 1–0 in the first chukker, or seven-minute quarter, when he hit the turf. He would go on to score two goals to Nacho's one, the first on a rebound off the wall and the second on a fast break which made the score 5–3 with only three minutes to play. Nacho's Black Watch nonetheless tied the score at five all with 90 seconds to play, and a brief huddle at midfield to decide whether or not to continue playing (for the horse's sake in the 90-degree heat), two minutes were put back on the clock for overtime. Harry had a pair of chances to hit the game-winning shot, but fired wide left each time. Nacho is right about one thing: Even to the uninitiated, polo is an inarguably beautiful game. The sound of hooves hitting the turf as the pack charges toward the sideline is to polo as the crack of the bat is to baseball — pulse-quickening and iconic. And for all the pratfalls and sloppiness on display Sunday — Harry's tumble, mallets whiffing, horses overshooting the ball — there were moments of undeniable skill, as when Nicolas Roldan (the best player on the field) raced downfield in traffic, juggling the ball off his outstretched mallet for three bounces, in a move reminiscent of Tiger Woods playing hacky sack with his sand wedge. (He's the youngest player to ever win a U.S. Open in polo; he's kind of the A-Rod to Nacho's Jeter.) Or when another player banked a goal off an opponent's horse. After the match, and after Nacho had been named the MVP (for which he was awarded a six-figure watch he immediately announced he would auction for charity), he walked over with a grin and asked, "Well, do you think we had success today, or not?" He wasn't referring to the number of $50,000 tables sold but the fans on the far sideline — as many as 8,000 spectators who had packed picnic tables and bleachers to watch for free. "I think we're on the right track," he said, but 8,000 people is still a far cry from the crowd who throng Monaco for Formula One, or even the 30,000 expected for matches during the 2012 polo World Cup in Argentina. Nacho will likely play for the host, leaving the role of Landon Donovan to Nic Roldan, "who definitely has the potential to be that guy," in his estimation. What's holding back the sport is a divide that on Sunday took the form of a white rope and guards preventing the commoners from storming the pitch at halftime, when the crowd is traditionally invited to stomp the divots back into the turf. Nacho seized the opportunity to run the length of the sideline high-fiving spectators, who watched forlornly as the VIPs, VVIPs, and VVVIPs frolicked on the field.